For converted 15 gallon Sanke kegs (keggles). We supply a 1/2" outer diameter (OD) custom dip tube and 1/2" NPT connector. What NPT fitting does your keggle have? Shipping: Hop Stopper products must be ordered separately as they ship direct from the manufacturer in Tennessee. For US orders USPS standard domestic (2-5 days with tracking) is used. For international orders USPS economy (up to 3-4 weeks without tracking) or USPS priority air (up to 6-10 days with tracking) are available at checkout. Most orders ship within 1 day of payment. 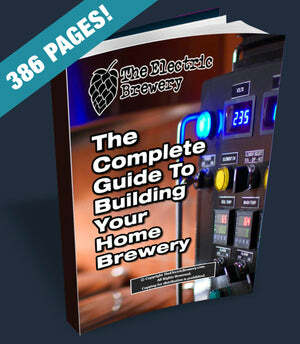 THE BEST BOIL KETTLE HOP FILTER AVAILABLE! Extract every last drop of wort, save time, and maximize hop flavour! Stop using inefficient bags, tea balls, or hop spiders which limit hop utilization - let your hops roam free! The new Hop Stopper 2.0 is the best Boil Kettle hop filter we've ever used! Version 2.0 has been completely revamped and updated to maximize hop and hot break filtration while saving time. No recirculation required, no settling time required, no whirlpool required. Start draining immediately after the boil to better lock in those bright late addition hop flavours. Works equally well with intensely hop-heavy IPAs, DIPAs, and NEIPAs with pounds of hops, to delicate light lagers with only an ounce or two. Low quantities of hops can actually be harder to filter as the hot break and other fine particulates that settle out can form a thin layer on whatever filter you're using which in turn blocks the flow. Not a concern with the Hop Stopper 2.0! Models to fit just about any kettle are available. The Hop Stopper 2.0 comes with a very generous return policy: Use it for up to a year from the date of purchase and if you don't like it for whatever reason, you can return it. Along the way we will work personally with every customer if they need it. Increased filtration: The new inverted design puts the largest filtering area at the bottom of kettle to provide maximum filtration at the end of draining (where you need it the most). The innovative “Hop Cone” feature provides a pocket for hops to settle while providing maximum screen area for filtration. This new design works wonderfully with all beer styles from hoppy IPAs with a pound or more of hops to light lagers with only an ounce or two. Faster filtering: Previously the pump had to be slowed once the filter was exposed to air. This is no longer true with the Hop Stopper 2.0. Keep the pump running at higher speed for reduced chill times. We cool 12 gallons of wort to pitch temp in less than 15 minutes! Faster cooling means better locking in of late hop addition flavours, important for hop forward beers. Recirculation: Improved performance for immersion chillers and recirculation processes. (Refer to the user's manual for speed details). Reduced height: Low profile design meant for tight spaces, including under heating elements. Quick push-fit dip tube: The new high temperature silicone grommet eliminates all clamps and screws and can be used with virtually any existing dip tube. More kettle options: Available for just about any boil kettle, with optional custom dip tubes and NPT connectors for kettles with threaded fittings. What does the Hop Stopper 2.0 filter? What kind of hops can I use? The Hop Stopper 2.0 filters out any types of hops you want to throw at it including pellet hops and whole leaf (cone) hops. It also filters out hot break and other coagulates, as well as any spices or special kettle additions you may wish to use. If using an immersion chiller it will also filter out cold break. How does the Hop Stopper 2.0 compare to using strainer bags or hop spiders? Some brewers like to put their hops in little bags, tea balls, spice infusers, or hop spiders that hang off the side of the kettle. While these solutions can filter out hops at the end of the boil, they do nothing to keep the hot break, cold break, and other coagulates out of your fermenter. They only filter out hops. Most cause the hops to clump together, reducing oil extraction. Fine mesh hop spiders and bags restrict flow which further reduces hop utilization. The fabric bags that some brewers use may not be food safe. The Hop Stopper 2.0 on the other hand allows for efficient filtering of hop break, cold break (if using an immersion chiller), and hops. Quite a bit of research and testing went into developing the Hop Stopper 2.0 resulting in a mesh that is fine enough to filter out debris, but still large enough to allow flow through the screen. The Hop Stopper 2.0 ensures maximum possible hop utilization since the hops are not contained but free in the total boil volume and then filtered after the boil is over. Maximize your hop potential by letting your hops roam free! (Same as when dry hopping). What kettles will the Hop Stopper 2.0 work with? Hop Stoppers are available for any kettle size from just about any manufacturer. See out complete line of Hop Stopper products. Not sure what's right for you? Contact us with your kettle brand, size, and type of fitting. What sizes of Hop Stopper 2.0 are available? Two sizes are available: Standard and XL (extra large). The standard is 9.75" in diameter and 2" high (minus dip tube) while the XL version is 14.25" in diameter and 3" high (minus dip tube). What size do I need? What is the maximum amount of hops the Hop Stopper 2.0 can handle? The Hop Stopper 2.0 was designed to offer filtering performance regardless of your processes, however, things like immersion chilling and recirculation create an added workload for the screen. The standard Hop Stopper 2.0 should be able to handle any hop load (including overhopped IPAs and NEIPAs) for kettles up to 30 gallons. For kettles larger than 30 gallons or for situations that require an extra amount of filtering such as boil kettle recirculating setups, the Hop Stopper 2.0 XL is recommended as the larger size provides more than double the surface filtering area. Note: While your boil kettle may be able to accommodate the diameter of the Hop Stopper 2.0 XL, be sure to take into account other items installed in your kettle such as heating elements which may make it difficult to maneuver the Hop Stopper 2.0 XL into position. For example, our Blichmann 20 gallon kettle with a heating element will not accept the Hop Stopper 2.0 XL even though the overall diameter of the kettle is nearly 4" wider than required and we have enough clearance below the heating element. The issue is that there simply isn't enough room to maneuver the Hop Stopper 2.0 XL into position due to the heating element (centered 4" from the bottom). No concerns here as the standard sized Hop Stopper 2.0 provides excellent filtering for even heavily hop loaded beers in kettles up to and including 30 gallons in size. Does the Hop Stopper 2.0 work with gas and electric setups? Yes. How you heat (gas, electric, or steam) does not matter. Does the Hop Stopper 2.0 work with gravity fed setups? Yes. The Hop Stopper 2.0 does not require a pump to work. Does the Hop Stopper 2.0 work with all-grain and extract brewing? Yes. You can brew both extract and all-grain and then filter with the Hop Stopper. Does the Hop Stopper 2.0 work in all-in-one / BIAB (Brew in a Bag) setups? In a typical 3-kettle setup such as the one we document in our Building Your Brewery articles the kettles (boil, mash / lauter tun, hot liquor tank) are separate and optimized for the steps they perform. With all-in-one setups sacrifices have to be made as all steps (heating, mashing, sparging, boiling) are done in a single vessel. The Hop Stopper is optimized to filter hops and other additions in the boil kettle. It is not well suited for filtering other particulates given the differences in size / density. For example, during mashing there is a tremendous amount of dust and protein in the liquid from the crushed grain that can easily clog the Hop Stopper. On a 3-kettle setup the grain bed in the mash / lauter tun filters these out either through constant recirculation or through vorlauf at the end of the mash before the wort is introduced to the boil kettle with the Hop Stopper. On an all-in-one setup however, this pre-boil filtration is not easily achievable as the Hop Stopper has to already be in place. If your all-in-one setup recirculates during the mash, it should not be done through the Hop Stopper as the dust and protein may clog the screen. Instead, a second port should be used during mash recirculation such that the Hop Stopper is not being relied upon to filter the mash liquid. Most all-in-one setups do not have a second port, so this would have to be added. On an all-in-one setup care should also be taken to ensure that the weight of the grain is kept off the Hop Stopper to avoid crushing the screen. Typically the Hop Stopper will need to sit underneath the mash basket, and unfortunately most all-in-one setups are made to be as compact as possible and do not have room to accommodate the Hop Stopper. When designing a brewery we recommend an open source 3-kettle design as it maximizes compatibility with add-on devices like the Hop Stopper. Most all-in-one setups are proprietary designs that are purposely made to only work with products from the same manufacturer. That said, we are constantly evaluating new product designs, including Hop Stoppers for all-in-one setups. Sign up to our newsletter or follow us on social media to be notified when new products become available. Do I still need to whirlpool/recirculate in my boil kettle? No! That's a huge benefit of the Hop Stopper: After the boil there is no need to whirlpool or recirculate and then allow your trub and hops to settle in a cone before draining the kettle. You can start draining immediately after the boil. Flame (or element) off and start chilling immediately. This not only saves time, but also helps locks in those bright late addition hop flavours instead of simply adding more bitterness. Ideal for IPAs, DIPAs, and NEIPAs. Hop character is extracted as a function of contact time and temperature. We recommend tossing in your last hop addition, let it steep (if you like), then drain without recirculation. As the hops settle on the screen, the flow of wort through the hop layer will extract hop character much like a hop back. I recirculate to sanitize my chiller. Can I still do that? Yes. Keep the speed below 1 GPM (gallon per minute). Faster flow doesn't offer any benefits when sanitizing. Refer to the user's manual for more information. Can I replace my original Hop Stopper with the Hop Stopper 2.0? Yes. Assuming you purchase the same size (standard or XL) the Hop Stopper 2.0 is a drop in replacement for the original Hop Stopper and will fit in your setup. No modifications required. Can I re-use the dip tube from my original Hop Stopper with the Hop Stopper 2.0? Maybe. You can reuse the dip tube from your old Hop Stopper if you trim the end to make it shorter horizontally. For example, a typical dip tube for the old BK30 model was over 6” long, but it could be cut down to about 3” to be used with the Hop Stopper 2.0 screen. If in doubt, order your Hop Stopper 2.0 with a new dip tube. Can I use the dip tube from my Blichmann kettle with the Hop Stopper 2.0? Yes, but with a modification: While the Hop Stopper 2.0 dip tube supplied for a Blichmann kettle is the same height and length as the one that Blichmann ships with their kettles, the Hop Stopper 2.0 dip tube has a special notch cut out that is critical for the proper functioning of the filter. To use your existing Blichmann dip tube, this notch will also have to be cut. See the user's manual for instructions. We recommend not altering your kettle's original dip tube in case it ever needs to be repurposed, and instead ordering a Hop Stopper 2.0 made specifically for a Blichmann kettle as the special notched dip tube is already included. Can I use the Hop Stopper 2.0 with a SS Brewtech kettle (non-BME version)? Purchase a Hop Stopper for SS Brewtech and we will include a modified dip tube. Keep your existing (unmodified) dip tube as a backup. Send us your existing dip tube for modification and order a Hop Stopper 2.0 (screen only option). We will modify your dip tube for free and return it with your Hop Stopper order. Contact us if interested. Modify your own dip tube and order the Hop Stopper 2.0 screen only. See below for modification instructions. Can I supply my own dip tube? Can I buy just the screen? Yes. The two sizes of Hop Stopper 2.0 screens may be purchased separately without dip tubes. How do I measure the vertical height of the kettle outlet? Place a board or other straight and rigid object across the top of the kettle or keg (a 2 x 4 works well). Measure from the underside of the board down to the bottom center of the kettle (Dim A). Write this number down. Now measure from the underside of the board down the outside of the kettle to the center of the outlet fitting (Dim B). Subtract B from A to get X. X is the dip tube vertical height. Although the figure above shows a converted keg, this procedure also works for flat bottomed kettles. Can I use a pump with the Hop Stopper 2.0? In cases where a pump will be used, it is recommended to keep the flow rate below 1 GPM (gallon per minute). The reason for this is to avoid compacting trub on the surface of the screen and potentially drawing a negative pressure inside the screen cavity. A pump makes it possible to flow wort through the screen faster than it can naturally flow which can pull negative pressure inside the screen cavity and potentially collapse it. Keeping the flow rate below 1 GPM will help keep this from happening. Due to the new design of the Hop Stopper 2.0, there should be no need to slow the pump rate to a very slow trickle as soon as the Hop Stopper 2.0 becomes exposed to air (as was the case in the original design). Keep the same rate throughout the chill. How do I clean the Hop Stopper 2.0? Who uses the Hop Stopper? Brewers worldwide (both professional and hobbyists) use the Hop Stopper. This includes brewers in all 50 United States, every continent except Antarctica, and dozens of countries including Australia, Belgium, Brazil, Canada, Czech Republic, Denmark, England, Finland, France, Greece, Hong Kong, Iceland, Ireland, Japan, Malta, New Zealand, Norway, Romania, Senegal, Singapore, South Africa, Spain, Sweden, Switzerland, Thailand. What is the Hop Stopper made of? The Hop Stopper mesh is made of 304 stainless steel (18-8 grade). The red o-ring is made of high temperature silicone that is FDA compliant and can withstand temperatures from -65F to +450F. "Just wanted to let you know I used the new hop stopper 2.0 for the first time this morning and all I can say is wow. Well worth the investment and fixes all of the problems of the first version. I am very, very impressed and won't hesitate to recommend it to my friends with similar setups!" - Justin B. "Daaaaamn, that Hop Stopper 2.0 is awesome. Ran a constant flow out of the bk, as fast as i could go, based on my cooling water temp. Hose from bk to pump drained, closed the valve, ran it for another minute cracked open, got maybe another pint out of it. and that was it, i literally couldn't get any more volume out of the bk since there was nothing left!" "Did a west coast ipa on sunday, 10.5 oz of hops in the kettle. Performed flawlessly." "Used this again yesterday, 4.5 oz hops in a porter. Hop/break residue was caked/hardened to the hopstopper and the bottom of the kettle after draining and i don't mean in a bad way, more like 'all the liquid has been sucked out and there is nothing left'! I've actually reduced batch volumes by a half gallon or so because of how efficient it is at grabbing all the liquid. After kegging the first couple brews, i was all 'wtf, how come i have so much beer left over? "I bought a Hop Stopper last week and used it last weekend to brew a Belgian Dubbel. This was the first time I did not use a hop bag for my hop additions and on top of that I used some pureed organic raisins near the end of the boil. I'm happy to report that the hop stopper left all the hops, raisin fiber and hot break in the kettle! I have an American Brown on the itinerary with whole and leaf hops and I have no doubt now the Hop Stopper will handle that with ease too. It's nice not to have to mess with those bags. Thank you for a good product and especially for your quick response time." - Harvey H.
Visit our official Hop Stopper product thread in our forum.